Toni Morrison is the first African American woman to win the Nobel Prize for Literature. She is best known for her novels focusing on intimate relationships, especially between men and women. These stories are set against the backdrop of African American culture. 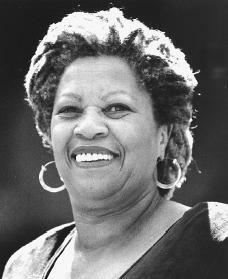 Toni Morrison was born Chloe Anthony Wofford in Lorain, Ohio, on February 18, 1931. She was the second of four children born to Ramah and George Wofford. Her mother's parents, Ardelia and John Solomon Willis, had left Greenville, Alabama, around 1910 after they lost their farm because of debts that they could not repay. Morrison's father's family left Georgia and moved north to escape sharecropping (a system of farming in which a farmer works on someone else's land and pays the owner a share of the crop) and violence against African Americans in the South. Both families settled in the steel-mill town of Lorain on Lake Erie. Morrison grew up during the Great Depression in the 1930s, a time of severe economic hardship. Her father supported the family by working three jobs for seventeen years. Morrison's childhood was filled with African American folklore, music, rituals, and myths. Her family was, as Morrison says, "intimate with the supernatural" and frequently used visions and signs to predict the future. Storytelling was an important part of life in the Wofford family and both the children and the adults would share stories with one another. Morrison sees her writing functioning much like storytelling did in the past. It reminds people about their heritage and shows them their place in the community. She has said that she uses her childhood memories to help her start writing. Her real-life world, therefore, is often included in her novels. Once Morrison learned how to read, it became one of the things in life that she loved spending time doing. When she was in high school, she began to read the works of great authors such as Jane Austen (1775–1817), Leo Tolstoy (1828–1910), and the nineteenth-century French writer Gustave Flaubert (1821–1880). Morrison was impressed by the specific way these writers portrayed the things that they were familiar with. Their talents motivated her to write in such a way about the things she was most familiar with, particularly her African American culture. In 1949 Morrison went to Howard University in Washington, D.C., to study English. She changed her name to Toni because people at Howard had trouble pronouncing the name Chloe. While at Howard she was a member of the Howard University Players, a theater company that presented plays about the lives of African American people. Morrison received her bachelor of arts degree in English from Howard in 1953. After she received her master's degree in English from Cornell University in Ithaca, New York, in 1955, she taught for two years at Texas Southern University in Houston. Then she returned to Howard University to teach. also taught at the university. The couple married in 1958 and had two sons, Harold (also known as Ford) and Slade, before divorcing in 1964. Then Morrison went to Syracuse, New York, and began working as an editor for a Random House company. She had two small children and free time in the evenings. This environment helped her turn her attention to writing novels. In 1968 Morrison moved to New York City, where she continued working as an editor for Random House. She eventually became a senior editor and was the only African American woman to have that job in the company. While there she helped to publish books by African American writers, including Toni Cade Bambara (1939–1995), Gayl Jones (1949–), and June Jordan (1936–). She also taught part-time, lectured across the country, and wrote many novels. Morrison began writing her first novel, The Bluest Eye (1970), while she was in a writers' group at Howard University. The story is about an African American girl who wishes that her eyes were blue and fit a different image of beauty. Thirty years later the book still speaks to a universal audience and was chosen to be an Oprah Winfrey Book Club selection. Sula (1974), Morrison's second novel, was nominated for a National Book Award. Her third book, Song of Solomon (1977), won a National Book Critics Circle Award in 1977 and an American Academy of Arts and Letters Award. It was also chosen as the second novel by an African American to be a Book-of-the-Month selection. Tar Baby was published in 1981. Beloved (1987) won the Pulitzer Prize in 1988. Jazz was published in 1992 and Paradise followed in 1997. Meanwhile, Morrison worked as writer-in-residence at the State University of New York, first at Stony Brook and later at Albany, before moving on to Princeton University in New Jersey. Morrison's novels are carefully written to produce poetic phrases and strong emotional responses from her readers. Her characters try to understand the truth about the world they live in. The subjects she writes about include good and evil, love and hate, beauty and ugliness, friendship, and death. Beloved, a story about life after slavery, is considered Morrison's masterpiece. In 1993, when she won the Nobel Prize for Literature for the body of her work, the Nobel Commit tee cited Beloved as Morrison's outstanding work. In 1996 she received a Medal for Dis tinguished Contribution to American Letters from the National Book Foundation. In 1999 Morrison's first children's book, The Big Box, was published. She worked on the book together with her son Slade. The story is a dark look at childhood in America that pushes children and parents to take a new look at the rules and values that make up their lives. The book shows the ways in which well-meaning adults sometimes block children's independence and creativity. In 2001 Toni Morrison was given a National Arts and Humanities Award by Pres ident Bill Clinton in Washington, D.C. The president gave a speech during the award ceremony and said that Morrison had "entered America's heart." Blashfield, Jean F. Toni Morrison. Philadelphia: Chelsea House, 2001. Jones, Amy Robin. Toni Morrison. Chanhas sen, MN: Child's World, 2002. Kramer, Barbara. Toni Morrison, Nobel Prize–Winning Author. Springfield, NJ: Enslow Publishers, 1996. Morrison, Jim Morse, Samuel F. B.